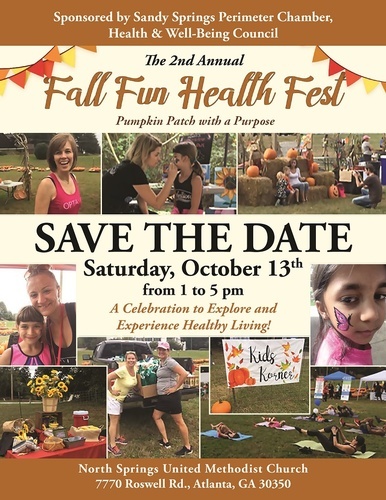 For health-conscious families and local residents who want to enjoy a great Saturday afternoon, The Sandy Springs Perimeter Chamber of Commerce is proud to announce a Fall Fun Health Fest. Sponsored by the Health & Well-Being Council of the SSPC, this event is a Free Festival to Explore and Experience Healthy Living! The Fall Fun Health Fest is a great way to Disconnect From Your Phones and Reconnect with Your Family, Friends and Community. Great Prizes Will Be Awarded Every 30 Minutes to Attendees From Local Health Professionals, Restaurants and Experts. And Attendees can purchase their perfect pumpkin from The Pumpkin Patch!